Panorama exeptionnel, bright apartment, very quiet. High tides. Comfortable, close to the beaches. 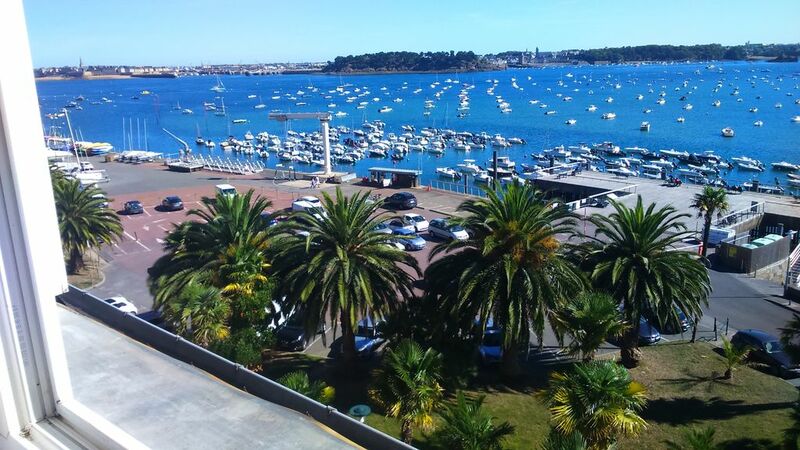 Very bright apartment with magnificent views of the sea, the port, and the Bay of St Malo in the background, a city that you can reach by star in 10 minutes, departure nearby. Simple and well equipped apartment. You can do everything on foot, beach, local shops, intermarché, plus three large markets per week. A very nice pedestrian stroll by the sea at the foot of the building, with sound and light summer evenings. You will take your meals while admiring the sea. LARGE TIDAL (large coefficients). You will be in the front row without leaving the apartment, sea view (high tide and low tide) of the window. Live show. Canoes can be rented at an additional cost on bail. Appartement très bien situé une superbe vue. Etat propre avec tout le confort. Revoir la robinetterie de la douche elle coule peu (salle de bain). Bel appartement Dinardais en bord de mer ! Appartement calme à 5' de la mer. Il est Fonctionnel, pratique, propre, bien entretenu et lumineux. La vue sur la mer est magnifique ! Les enfants etaient ravis des livres et dvd à leur disposition. Nous le louerons de nouveau, sans hésiter ! Merci pour ce commentaire très positif sur notre location. Astonishing travelers in St Malo 10mn by car, or featured departure nearby. ROUTE DU RHUM (10 minutes in the spotlight). Featured, you will discover St Malo without the worry of the car. You are 20 minutes from Dinan, medieval city and its ramparts. Just 10 minutes from St Malo, corsair city. A one hour from Mont St Michel and Cape fréhel. The hotel is 30 minutes from Cancale and its oyster beds. De novembre à mars, il faut ajouter 40 euros de chauffage par semaine. Les week-ends fériés sont au tarif haute saison. Pour les locations au week-end, le tarif est en fonction du nombre de personnes.